Ill holidaymakers returning from the resorts of Puerto de Santiago or Playa Paraiso in Tenerife can claim compensation from their holiday company pursuant to the 1992 Package Travel Regulations. The regulations enable sick travellers to claim compensation for the failures of foreign hoteliers from their tour operator. If you booked flights and accommodation with holiday companies such as Jet2Holidays, Thomson, Airtours and Thomas Cook and blame poor hygiene, food poisoning or water contamination call one of our holiday claims specialist today on 0808 145 1353. Suffered Food Poisoning in Tenerife? Tenerife – Claim Compensation for your Illness. Puerto de Santiago - Food Poisoning and Gastric Bugs? The small resort of Puerto de Santiago is a good choice for bars and restaurants and it provides a delightful setting for those holidaymakers looking to relax and watch the world go by. Santiago is a charming village on a spectacular coast line with a nearby marina, rock enclaves and spectacular views of the black cliff of Los Gigantes. Check out our Hotel Watch page to avoid illness. Dysentery Fact: Holidaymakers suffering from bacterial dysentery, such as Shigella, usually recover within a couple of weeks. Amoebic dysentery is difficult to get rid of, and occasionally an inflammation of the colon will give rise to a blockage some years later. The symptoms can be aided by the use of antibiotics, such as Ciprofloxacin and Metronidazole. Playa Paraiso – Tenerife Food Poisoning Claims! Located on the south west coast of Tenerife, Playa Paraiso is a small fishing village nestled in coves amongst the dramatic cliffs, on the edge of banana plantations. The resort is a quiet place and enjoys activities such as scuba diving and plentiful walks. One of the most common causes of travellers' diarrhoea is E. Coli, which is a bacterial infection often associated with the consumption of undercooked or improperly refrigerated food. Tour operators such as Thomas Cook – Jet2Holidays - First Choice and Thomson Holidays often attempt to avoid liability by suggesting travellers’ diarrhoea has nothing to do with food poisoning and is caused by change in climate, dehydration and viruses. Travellers who suffer illness due to food poisoning from E. Coli, Salmonella, and Cryptosporidium are often entitled to substantial compensation – food poisoning lasting 12 days is worth over £1250.00. 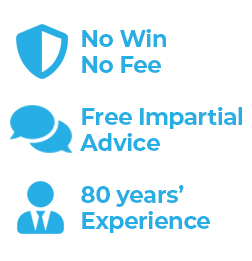 Why not prevent a holiday company’s legal team from taking advantage of your lack of legal knowledge and skill and permit Simpson Millar solicitors claims team to represent you on a 'No Win No Fee' Basis?